Thief offers a one player stealth game that lets your fingers do the taking as item grabbing success depends on expert control, reaction times, and multitasking. Set in London, England during the late 18th/early 19th century, Thief gives players numerous, open-ended situations, so they always have multiple ways to go for the gold and dispatch any enemies. 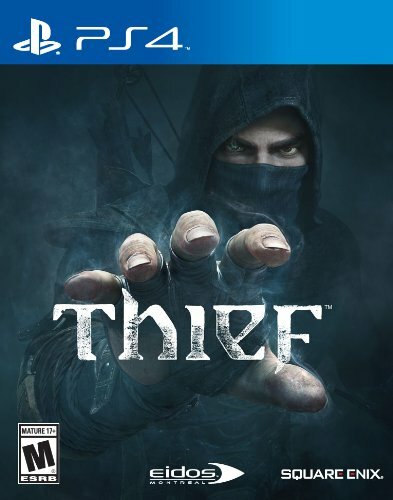 Developer Eidos Montreal and publisher Square Enix create a nice stealth stealing experience, which is the fourth installment in the game series but seemed more like a reboot into next-gen graphics than a sequel to the previous 2004 installment, Thief: Deadly Shadows. The story leverages both perspectives using high quality level designs. Thief steals the spotlight again as players can experience the continuing game series with the returning main protagonist, Garrett. He returns to his hometown (a.k.a. The City) where an antagonistic “Baron” and a “Gloom” plague run rampant. This eight chapter story has reloadable checkpoints and three save slots. Online elements include special challenges and leader boards so players can get their thieving thrills in shorter sessions than brag about it and/or test/measure their skills. The logical setting for Thief occurs at night while the story adds a female protégé named Erin that adds some intrigue as well as some character development for Garrett. The story also presents key supernatural elements, a key timeline jump, and additional characters (beyond Garrett’s contact Basso). The overall ethical dilemmas of simply being a thief are overshadowed by other elements that the protagonist characters must quell. The typical justifiable “Robin Hood” element does not permeate this story, but if protagonist characters don’t steal to help anyone but themselves then it’s hard to connect to them on a personal level. The supernatural elements carry the main burden of appeal and motivation for acquiring items while upgrades are available to refine and increase existing skills and gear. Thief takes place in the shadows, which developers represent strongly in the graphics while giving players special advantages to see what others cannot. Valuable objects are typically shimmering so players can easily spot them. Players get special vision enhancements as well as slow-motion action enhancements that help Garrett make key grabs or life saving moves. The slow-motion action is upgradeable. Rogue, thief, master and custom difficulty levels offer a nice new wrinkle. Players can change different aspects of the difficulty to make a more personal experience. The movements are a bit stiff and players cannot take cover in every spot, which diminishes that open world sensation. The thrill of the “take” is another great element in Thief’s success. Players can see the hand motions leading up to each grab, which increases the emotional and personal experience instead of just showing the item disappear with a corresponding sound effect. The map guides the action, but mainly helps to assess threats more than maneuvering through the environments. The heads-up display (HUD) provides more assistance and customization with a helpful arrow icon to help players navigate to the next objective in their main mission. Players can also pry windows, jump rooftops, disarm thief traps, pick locks, and maneuver through urban obstacles. Picking locks is very natural and fun primarily using the L1 and R2 buttons. The quick dash/sprint is great for crossing gaps and open areas. Blurring visuals also give players a nice sensation of the controlled action. Players can also take cover and peek around corners to view potential threats. Melee fighting is great as a last option and only when isolated. Developers purposely make it more difficult against multiple baddies to keep players on a stealthy path. Garett’s main gear includes a grappling claw, “knockout” blackjack tool, and compound bow – all practical and lethal. The bow archery expands with different arrow types including water, rope, and fire. This gear, especially the arrows, require players to carefully observe their environment to maximize their success…and impress with inventive ways to dispatch anyone in the way. The element of danger is realistic and fun, especially when overhearing the guards and other character converse among themselves. Players also get some entertaining reactions, but a few unnatural AI actions that diminish the realism a bit. Music composer Luc St. Pierre set the mood nicely with tension and thrills while the sound effects enhance the “ca-ching” thrill of nabbing valuable items. Overall, developers create a deep action experience with minimal violence and bits of black comedy where players get their main motivation from action interaction using the gear, item tallies and related statistics. The journal helps track progress as well. The solidly recommended (*** out of four stars) Thief has a high replay value, especially when including all the side missions, and is available via physical disc and download. Also available on PlayStation 3, Xbox One, Xbox 360, and PC. This entry was posted in Video Game Reviews and tagged Michael Siebenaler, Mike Siebenaler, PlayStation, Tall Writer, Thief, video games. Bookmark the permalink.